When I look back on my 30-year tenure as a climber, I realize that I’ve spent as much (or more) time descending than ascending. After all, knowing when to turn around is what keeps us climbers alive and climbing. All that “downtime” easily adds up to several thousand hours of dodgy anchors, scary raps, and uncertain ends. That stuff would make any grown man nervous, but by far the scariest experiences of all were the few times I’ve gotten the rappel rope hopelessly stuck. This scenario can cause even the hardest of climbers to break out in a cold sweat. When your rope is stuck, you ain’t going nowhere. Here are my hard-won tips for getting your rope unstuck and—even better—preventing it from happening in the first place. If you don’t know what this is, then don’t do another rappel until you read up. You should make carrying out a pull-test as second nature as using a rappel backup (you do use one, I hope; learn how at Rappel to Ascend. To do this, the leader (the first person down the rope) simply pulls the “pull rope” for a few feet to check that it will run smoothly when it’s being pulled from the lower position. When the climber at the top anchor sees the rope move, he should hang tight because the rope is being tested. If the rope doesn’t move smoothly and freely when pulled from down low, then the climber at the top can do something to fix it. The two main reasons for a rope refusing to budge are either too much friction over the length of the rappel, or a knot that is blocked by an obstacle close to the anchor. Always include a rappel ring or carabiner in the rap anchor, even if you have to add one yourself. This reduces friction and wear on both the webbing and the rope. On complex terrain, you may be better off making single-rope rappels (typically 30 meters). Having no knot joining the ropes means there’s no knot to get caught, and the shorter rappel distance means less overall friction. If you must use double-rope rappels, make some adjustments before the first person leaves the anchor. After you set up the rappel, pull the knot so it’s positioned lower than the belay ledge, which is a common place for the knot to get stuck. Keep in mind this will make one side of the rope shorter, but knots in the ends of the ropes should be there as a backup. Pay close attention to where the rope is running, and keep it clear of any cracks that could swallow it up; this might mean adjusting the anchor to redirect the rope. On snow and ice routes, you can also fill cracks with snow to block the rope’s entry. The best skill is to be aware. Using the European Death Knot (aka the EDK or flat overhand knot) to join two ropes greatly reduces the chances of a hang up, as the knot tends to roll onto its flat side when encountering objects. (Learn to tie it here.) If you use a double fisherman’s or a square knot, then you’re creating a knot with about 50 percent more surface area to catch. Plus, they can be very difficult to untie after being weighted. The EDK is the only knot any climber should use for joining ropes when rapping, and if it gives you the willies, I suggest you take up golf. Took all the proper precautions and still found yourself stuck with a stuck cord? 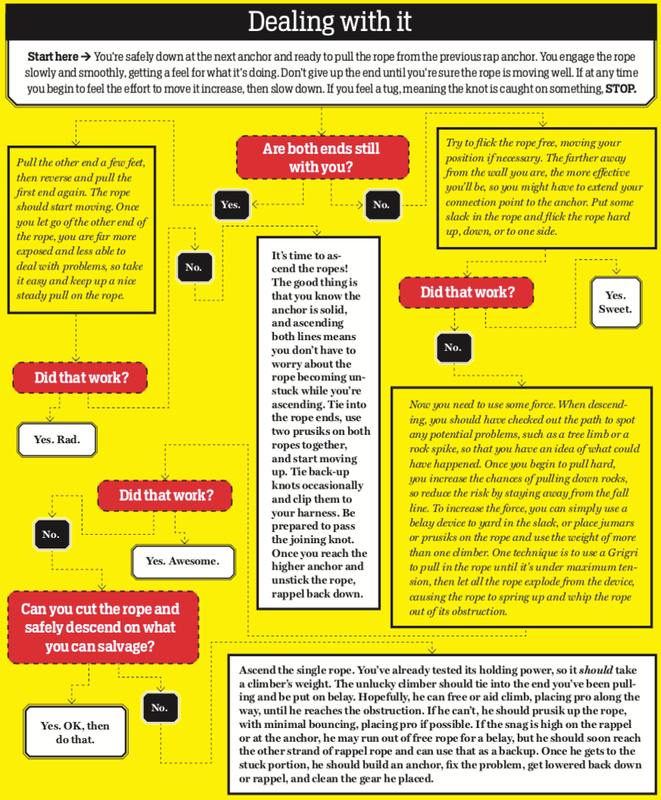 Follow the flowchart below to find the best course of action (click for full size). Always carry prusiks when doing multiple rappels, as you never know when you might need to ascend the rappel rope to unwedge a knot or get back to a higher anchor. Another option for really long rappel descents is to bring small mechanical ascenders. They can make ascending a rope much smoother and faster than prusiks. The benefit of prusiks is that they can be used on two ropes at once, while a mechanical ascender can only be used on a single line. Andy Kirkpatrick (andy-kirkpatrick.com) is a British climbing author with a reputation for stubbornness in the face of reality, high-risk objectives, a keen sense of humor, and bad teeth.